Church of the Resurrection of Christ in Rostov Veliky Kremlin, 210 km (130 miles) from Moscow. Tour will examine art and architecture of the Golden Ring. 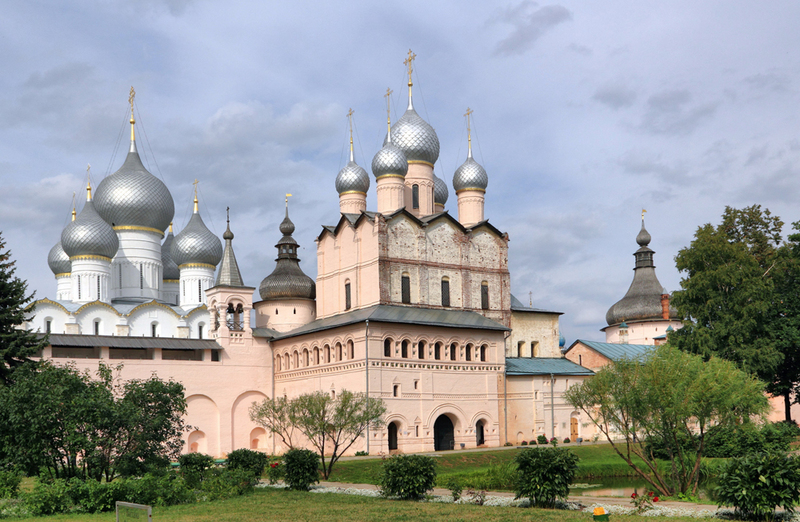 East of Moscow lies the “Golden Ring” of Russia, a land of small historical towns with onion-domed churches and a largely unspoiled countryside. The Gallery for Russian Arts and Design, which is usually referred to by its acronym GRAD, is organizing a cultural tour to these cities comprised of lectures and an in-depth examination of ancient Russian art from September 4-10, 2016. GRAD promises an intensive, but highly enjoyable program, that will include a series of lectures in English. Russian experts and art historians will discuss the works of art and architecture with tour participants. "GRAD cultural tours aim to take students out of the classroom and show them Russian art in Russia,” says Dr. Natalia Murray, the head of education at GRAD. “The best examples of icons and church frescoes can be found in Yaroslavl and old Russian towns along the banks of the Volga River." Murray says that the tour anticipates a wide range of attendees from students to people with a passion for Russian art and culture and everyone in between. “We think that it is important that it is not only Moscow and St. Petersburg that are recognized as cultural centers,” Murray said. “We want to show people the wealth of knowledge that can be gained by visiting some of [Russia’s] smaller cities." The tour is limited to just 15 persons, so interested parties are advised not to delay their applications. The group will be based in Yaroslavl, the Golden Ring’s largest city, during the trip. Each day they will visit a new town, taking in the monasteries, icons and other jewels of ancient Russia. Special visits will be made to Uglich, Kostroma, Vladimir and Suzdal, among other historic towns located in the area. A detailed program of the tour, along with information on tickets and accommodation is available on the GRAD website.